The Four Features Box is Great for Important Information! Say a little something about why your featured content is just so awesome. With fourteen boxes integrated into Criss Cross there is no end to the different types of content you can create. Everything from email forms to social profiles & sharing. Allow readers to connect with your social profiles and share your content with ease using different Criss Cross social boxes. Button couners, social icons & more. The Criss Cross skin was designed with to look beautiful on all types of media devices. Whether your readers are using a laptop or an iPhone, your site will look great! No one wants all their pages to look the same. The Criss Cross skin includes full width, landing, squeeze, & no-sidebars templates to cover all types of content. 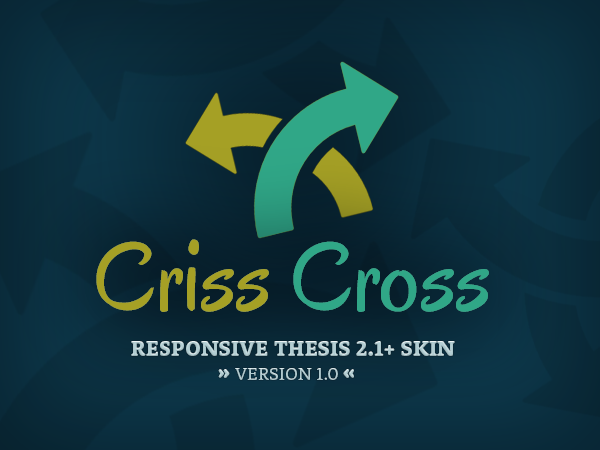 The Criss Cross skin for Thesis 2.1+ offers exciting features to create any type of website you desire. With page leads, boxes, widgets and CSS styles, Criss Cross gives users the ability to both beautiful looking websites as well as content-rich layouts. Criss Cross includes four boxes that were specifically designed as page leads. They are typically used between the header and content sections of any page template. Full-Width Lead Box – A lead for displaying simple text or HTML with the option of including a headline. Email Optin Lead Box – This box is similar to the Full-Width lead but also includes input for an email form. Four Features Lead – Four columns with an icon followed by headline/description content & a call-to-action button. Soliloquy Slider Lead – *Requires the free Soliloquy slider plugin and creates a full-width slider using the slider ID. Breadcrumbs Box – Add breadcrumb links to posts & pages by activating the breadcrumbs box in content options. Social Profiles Box – Enter the URL’s of your social profiles and display circular icon links throughout your site. Author Info Box – Similar to the Thesis author description box, but also includes links to your social profiles. Two & Three Column Boxes – Best used as page leads, add column boxes with an icon, headline & description. Social Count Buttons – Include the option for readers to share your content with social count buttons after posts. Call-out Action Box – A simple box for adding a headline along with a call-to-action button. Great as page lead. Simple Subscribe Box – Similar to the Call-out Action box but includes a horizontal email form instead of a link. In addition to having a couple exclusive widgets, the Criss Cross skin also provides numerous areas to use these widgets. The After Post/Page Widget adds an area below your content to display widgets. There are also options to use three or four columns of widgets in your footer. Promotions Widget – Add a widget box and include a product image, headline, description & call-t0-action link. Great for affiliate promotions. Featured Posts List – Include a WordPress Featured Image with your posts to display a thumbnail/headline list of your WordPress posts. Sidebar – Add widgets to the standard sidebar area of your skin. After Post/Page – Include a widget after your post/page content. Footer Widgets – Include three or four columns of footer widgets. Nobody wants every page on their website to look the same. With that in mind, Criss Cross was developed to satisfy all sorts of content needs. There are five great templates to choose from for customizing post or page appearance. Full Width Page – Get rid of the skins sidebar and include a full width content area. No Sidebars Post – Uses the standard post content area and removes the sidebar. No Sidebars Page – Same as the no sidebars post template but used for pages. Landing Page – Awesome landing pages (removes header menu & footer widgets). Squeeze Page – Similar to the landing page but without any header or footer. One of the greatest parts of the Criss Cross skin are its options for content and design styles. Easily customize the title/tagline, posts, pages, comment section, widget areas & more by activating/deactivating their Thesis checkboxes. Activating the Sidebar Email Form checkbox in content options includes a optin form in your skins sidebar, the form code can be customized within the Thesis skin editor section. Layout widths, font sizes, font families & color schemes can be customized within the Thesis design options section. Using the handy Thesis color scale you can create beautiful color schemes with one simple click or customize colors individually to your liking. In addition to the options previously mentioned, the Criss Cross skin also includes a few more great features. There are lots of text formatting & image styles that can be easily implemented using HTML or CSS, read about text formatting features in this post or check out the image styles right here. Criss Cross also comes with its own icon font that can be viewed within your Thesis skin options. Choose from hundreds of icons and use them anywhere on your site! If you don’t want to use the basic WordPress site title & tagline, you can use the Thesis Header Image option to add your company logo and replace the standard text link. Ready to Grab the Skin? There is no doubt Criss Cross will help you create exactly the type of website you desire. At the introductory price of only $27 you can own the skin and use it on as many websites as you like. Updates are free for life and your purchase also includes full access to the support forums & Thesis Laboratory community. The price wont be $27 for long so don’t hesitate, Grab Criss Cross Now!